For more than ten years, the North Carolina Forest Service has completed multiple stream and river restorations at DuPont State Recreational Forest (SRF) primarily to reduce sediment from overland erosion and improve water quality. Given the diversity of opportunities that exist to improve Dupont SRF's source waters, the agency contracted with survey and restoration experts in 2014 to assess and prioritize possible water resource improvements. 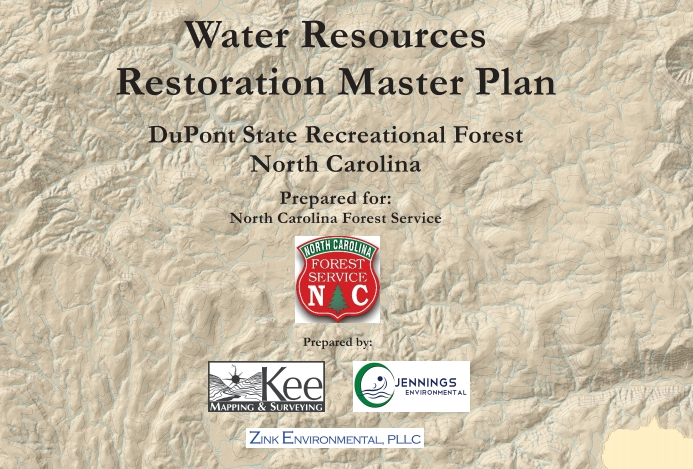 A Water Resources Restoration Master Plan template was developed in the 2014-15 timeframe to address the specific needs of the property, and the Master Plan was completed in November 2015. This Master Plan identifies future water resources restoration efforts needed to improve the water quality and ecological function of waters within DuPont SRF. The physical functions of some of the stream reaches included on the property are currently degraded due to adjacent land use, historical channelization and realignment. Existing undersized and oversized stream crossings on forest roads and trails have outlasted their intended design life and exhibit reduced function. Some of these adverse stream impacts resulted from the former landowner's intent and subsequent road construction to create an exclusive residential mountain top development. A number of water resource impacts have also been caused in recent years by heavy recreational pressure on the >80 miles of trails within DuPont SRF that are used for hiking, mountain biking, and horseback riding by approximately 350,000 visitors annually. The NCFS will utilize this Master Plan, which includes conceptual design information on prioritized stream reaches, to prioritize future water restoration efforts. The Master Plan can be downloaded in its entirety here or can be viewed by area of interest by using the web links found in the Table of Contents below.